What is a Chest Drain? The underwater seal prevents air re-entering the pleural space. Usually, the distal end of the drain tube is submerged 2cm under the surface level of the water in the drainage (or collection) chamber. This creates a hydrostatic resistance of +2cmH20 in the drainage chamber. Normal intrapleural pressure is negative. However, if air or fluid enters the pleural space, intrapleural pressure becomes positive. Air is eliminated from the pleural space into the drainage chamber when intrapleural pressure is greater than +2cmH20. Thus, air moves from a higher to lower pressure along a pressure gradient. The drainage chamber has a vent to allow air to escape the chamber, and not build up within the chamber. One-way mechanism to prevent return of air/fluid (valve). This system is suitable for the drainage of air and fluid. The first chamber is for collection of fluid and the second is for the collection of air. As the two are separate, fluid drainage does not adversely affect the pressure gradient for evacuation of air from the pleural space. A separate chamber for fluid collection enables monitoring of volume and expelled matter. 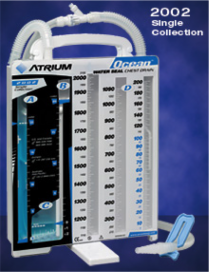 Suction is required when air or fluid needs a greater pressure gradient to move from the pleural space to the collection system. 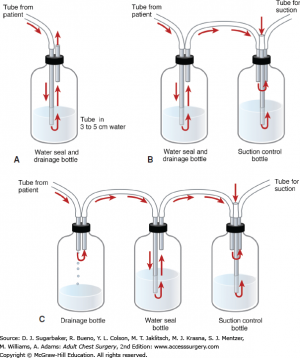 Suction may be applied via a third bottle or a suction chamber. Airflow is governed by changes in intra-pleural pressure. Negative pressure during inspiration causes water level to rise slightly. 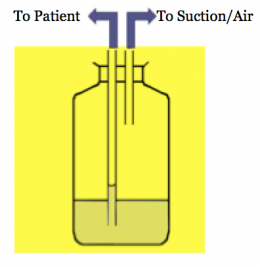 Positive pressure during expiration pushes air and fluid out of the pleural space and into the tube and collection bottle. Air bubbles out of tube into the underwater seal. Fluid drains by gravity, mixing with water and raising the fluid level. Chest drains are inserted as an invasive procedure to; Remove fluid/air from the pleural space/mediastinum, and/or Re-expand the lungs and restore negative intrapleural pressure and respiratory function. Pneumothorax - "Air in the pleural cavity". This occurs when there is a breach of the lung surface or chest wall which allows air to enter the pleural cavity and consequently cause the lung to collapse. Pleural Effusion - a collection of fluid abnormally present in the pleural space, usually resulting from excess fluid production and/or decreased lymphatic absorption. Haemothorax - the presence of blood in the pleural space. The source of blood may be the chest wall, lung parenchyma, heart, or great vessels. Chylothroax- is a type of pleural effusion. It results from lymph formed in the digestive system called chyle accumulating in the pleural cavity due to either disruption or obstruction of the thoracic duct. Empyema- is a collection or gathering of pus within a naturally existing anatomical cavity. For example, pleural empyema is empyema of the pleural cavity. It must be differentiated from an abscess, which is a collection of pus in a newly formed cavity. Local anaesthetic and intravenous analgesia are mandatory, as the placement is a painful procedure. The use of sedation should always be discussed with a senior emergency doctor, as it can potentially worsen the patient's clinical condition. Ensure local anaesthetic is infiltrated from subcutaneous tissue down to pleura. Select the appropriate size I.C.C. and remove stylet. Incise the skin parallel to the upper border of the rib below the chosen intercostal space. Incise down to the fascia. "Blunt dissect" (using an artery forcep) down to the pleura, enter the pleural space, and then widen the hole by opening the forceps. Sweep the pleural space with a gloved finger to widen the hole and push the lung away from the hole (only possible in older children, beware of rib fractures in injured child). Hold the tip of the catheter with a curved artery clamp and advance it into the pleural space, directing the catheter posteriorly and superiorly. Advance so that all apertures of the tube are in the chest and not visible. Attach the tube to UWSD below the patient's chest level. Anchor the drain and suture the wound. Tape in place with tegaderm sandwich and anchor the tube to the patient's side. - Connect to the UWSD. Watch for "swinging" of water in tube connection. Bubbling- Reflects the amount of air draining out of the pleural space. Usually occurs during expiration or coughing. May also occur on inspiration if big air leak present. Large volume air leaks may require suction to remove air; if persistent may require pleurodesis. Continuous bubbling – means there is a connection between the lung and intra pleural space. If bubbling stops check for; Kink, Blockage, Disconnection. Always ensure you know the location of chest drain clamps in case you need them in an emergency!! 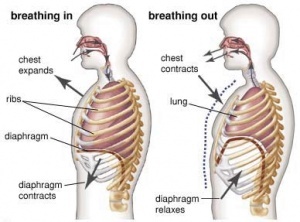 Clamping should be avoided if at all possible – clamping can cause a tension pneumothorax which leads to compression of the heart and a mediastinal shift which can be fatal. Don’t pass the chest drain over the patient – loss of gravity could cause contents to spill back into the pleural space. If you knock over the chest drain: put it back upright, check the levels and inform the nurse on duty so she can perform the necessary tests to make sure it’s still working properly. It is never appropriate to clamp chest drains for mobilisation / transport of patients. NEVER clamp in tension pneumothorax or if still bubbling. When would you clamp a drain? Positive pressure NIV techniques are CONTRAINDICATED! Patients can be mobilised with a chest drain. If they are on suction, check if it is a portable suction machine, if so, you will require a trolley to mobilise patient safely. If suction is attached to the wall & cannot be disconnected//consider bedside exercises. Always bring clamp in case of an accidental break in circuit. Always call a nurse if you think there is a problem. -Before and after treatment it is important to check the drain for any changes – if changes occur you need to document them and report them to the relevant member of the MDT eg) excessive drainage or no pressure swing during inspiration and expiration in the water seal level. Look for- oscillation, bubbling and draining. Always keep below the level of the patient. Patients can be mobilised with a chest drain- may require a trolley if suction present or multiply drains & other attachments (e.g. portable O2). ↑ 1.0 1.1 Charnock Y, Evans D. Nursing management of chest drains: a systematic review. Australian Critical Care. 2001 Nov 1;14(4):156-60. ↑ Sugarbaker D, Bueno R, Colson Y, Jaklitsch M, Krasna M, Mentzer S. Adult chest surgery. McGraw Hill Professional; 2014 Jul 22. ↑ Symbas PN. Chest drainage tubes. Surgical Clinics of North America. 1989 Feb 28;69(1):41-6. ↑ 6.0 6.1 6.2 6.3 6.4 Laws D, Neville E, Duffy J. BTS guidelines for the insertion of a chest drain. Thorax. 2003 May;58(Suppl 2):ii53. ↑ Broad MA, Quint M, Thomas S, Twose P. Cardiorespiratory Assessment of the Adult Patient-E-Book: A clinician's guide. Elsevier Health Sciences; 2012 Mar 21.